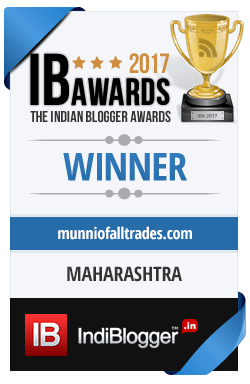 My earliest memory of meeting an elephant was at Rani Baug at Bombay. As an impressionable 7-year-old girl, I was in awe upon meeting the majestic creature with funny floppy ears and a mammoth trunk. “Horton Hears a Who” and “Mr. Galliano’s Circus” were two books that made me love elephants even more. Elephants are one of the most intelligent animals and it is often said that elephants do not forget kind or unkind behaviors towards them. They are truly remarkable creatures. My recent trip to meet the elephants at Manas National Park gave me the opportunity to meet the love of my life up, close and personal. This was my first trip to Assam, as one of the 12 ambassadors of Bodoland. We stayed at the Smiling Tusker Elephant Camp for three days. 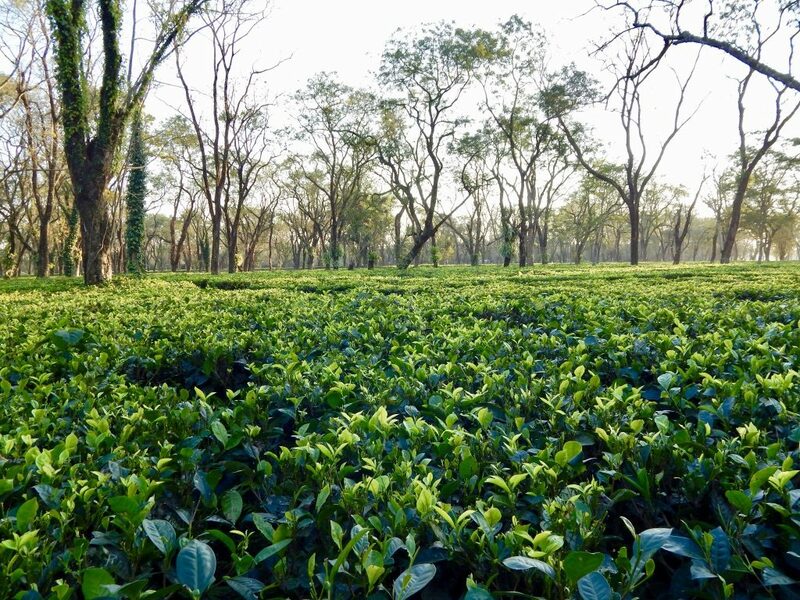 It is located close to the park boundary near a tea garden. You can stay in cottage tents, outdoor tents or the machan rooms. The entire space has been designed thoughtfully and the service is impeccable. I arrived at the camp just in time for lunch and halfway through I heard a mighty call. 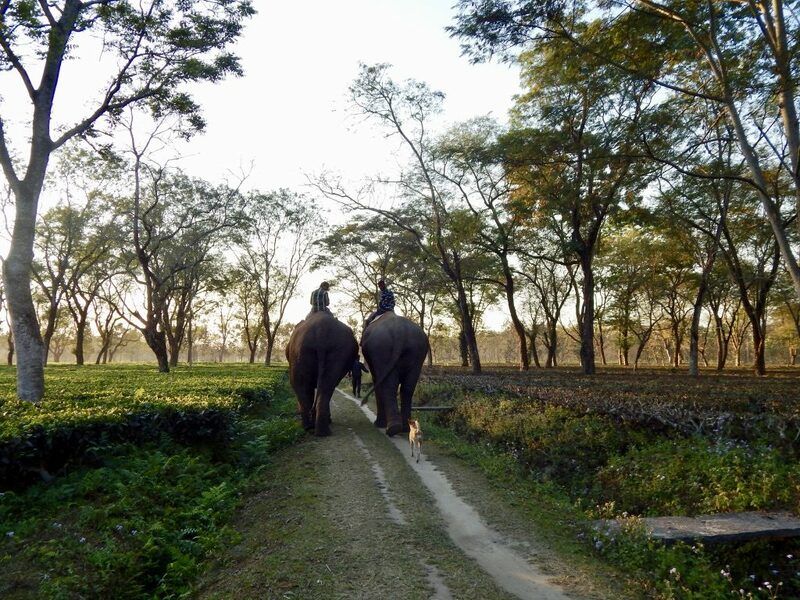 Ratnamala and Jaymala, our elephant companions had arrived and wanted to go for their bath. 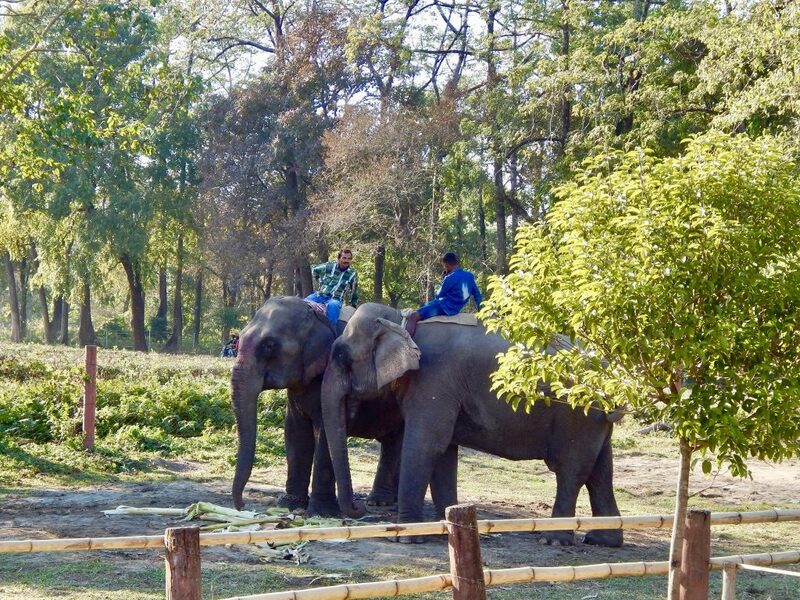 Both these elephants were orphans that were raised by the local mahouts. Both the elephants at the Smiling Tusker Elephant Camp were used to humans being around them and were quite friendly. 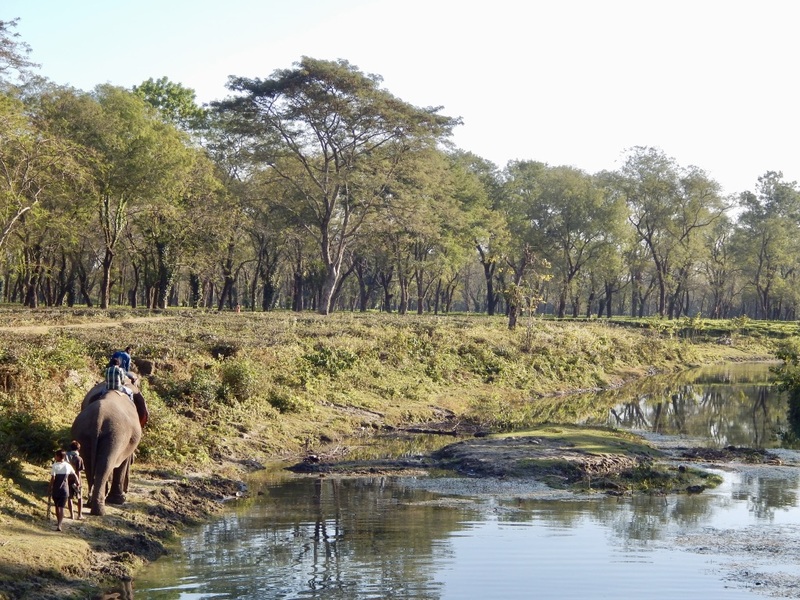 Manas National Park takes special care to ensure that the elephants are not overworked and have a limited set of activities every day. They firmly believe in developing the area as a sustainable, animal-friendly destination. Approaching Ratnamala and Jaymala was very easy. They were a friendly and playful pair. When you are standing close to an elephant, you can’t help but wonder how strong they really are. Yet, the gentleness in their eyes makes them seem so kind. After a quick photo session with them as they patiently posed for us, it was time for their bath! We made our way to the nearby pond and both Ratnamala and Jaymala settled in the water with a splash. It is time for a scrub! Did I want to go and bathe them personally? Did I imagine one hundred different ways in which my clumsy self might slip and fall in the terribly cold water? 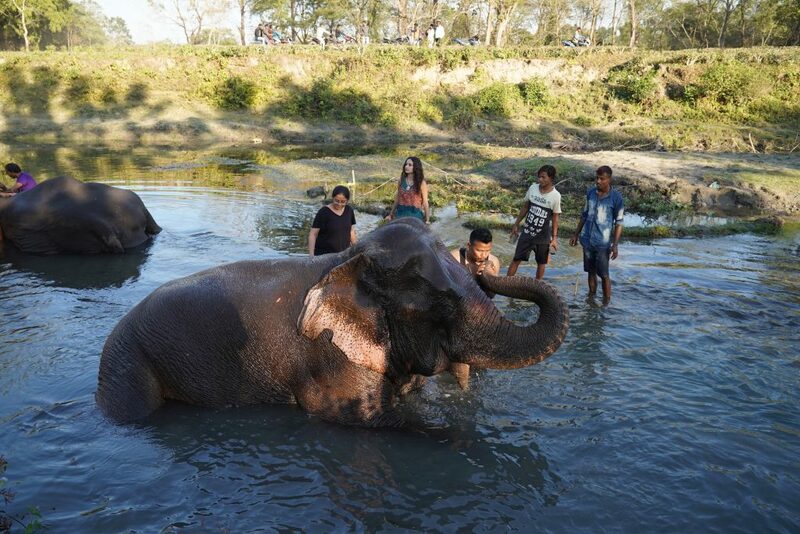 However, a few words of encouragement and assurances by the mahouts and my friends that the elephants would love to have me bathe them made me get into the water. I gingerly stepped in and went to Ratnamala who was happily lazing around. 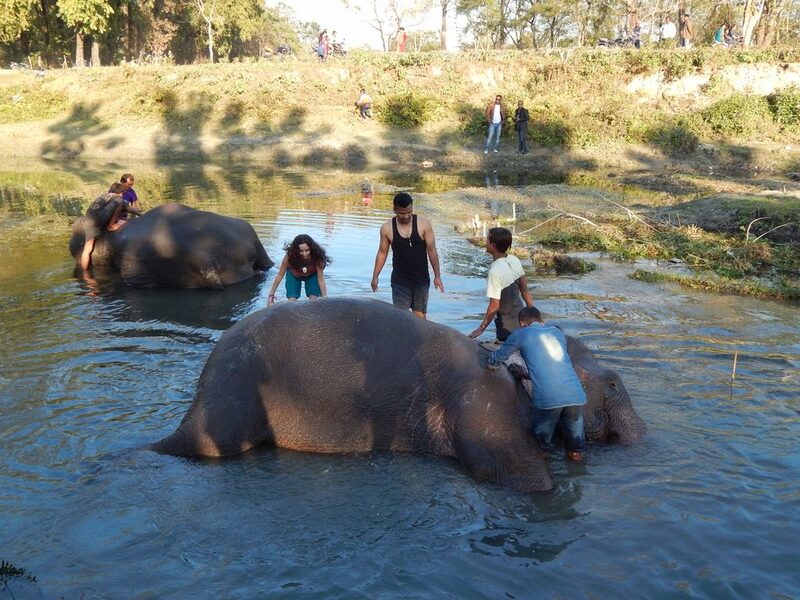 Alfred and Namita, my co-elephant bathers helped me get over my initial fear. Both the elephants would let out a trumpet of contentment as they were scrubbed with grass. 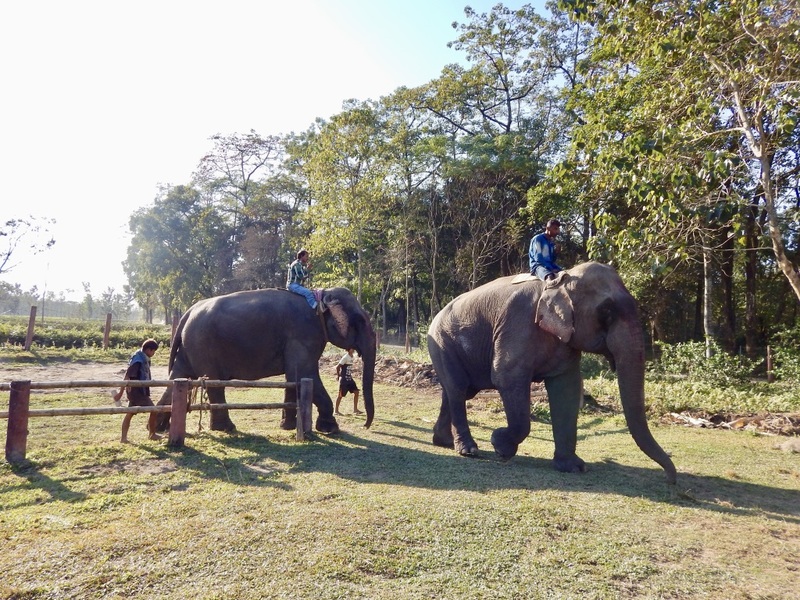 One interesting thing to note is that the mahouts spoke to the elephants in the local language and they would respond to them by waving their trunk. It felt surreal standing so close to both of them. Elephants can be surprisingly hairy and their skin is so tough that a good grass scrub makes them happy. The mahouts also apply a bit of oil around the eyes as it tends to get dry around the area. Towards the end of the bath, Ratnamala decided that the three humans i.e. Alfred, Namita and I were too dirty. It made sense for her to take some water in her trunk and give us a quick shower. It was extremely cold but it was worth it. Shivering, despite the strong sun on our backs, we made our way back to the Smiling Tusker Elephant Camp. After a quick change of clothing, it was time to go on a walk with our two gorgeous friends leading the way. A dog decided to follow us on our walk and remained our companion till the end. We became quite friendly with the elephants, too. 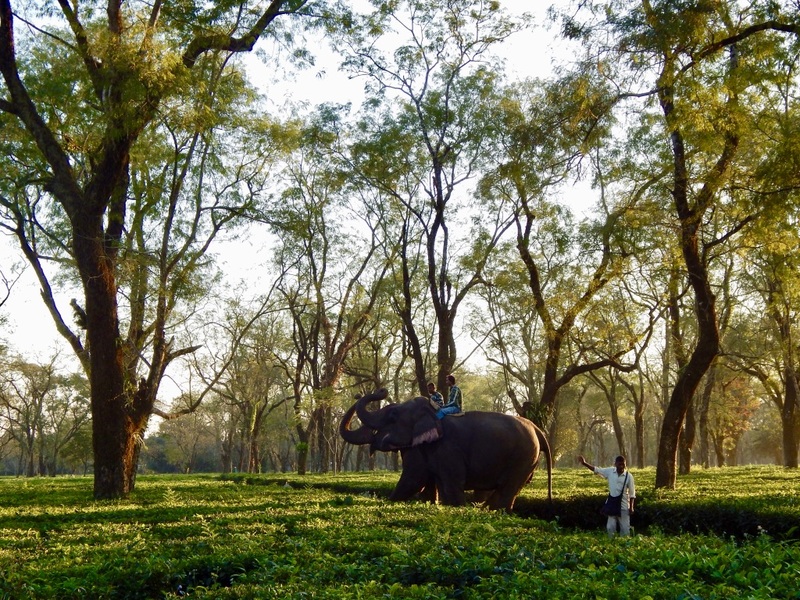 We ambled through the tea estates and watched both the elephants pluck branches for a quick snack. They would pause next to a tree, take a moment to think and …Crack! They would pluck a branch full of leaves. It was almost as if they were attending a buffet and they knew which branches would be delicious. A quick bite later, they would either decide to discard the branch or continue munching on it. The sun had almost set and it was time to return to the camp to huddle around a bonfire. Ratnamala and Jaymala retired for the day, too. After a delicious meal and swapping some tales, it was time to sleep. For the next day, I was going on an Elephant Safari in the deep jungle. Stay tuned for my next blog post. 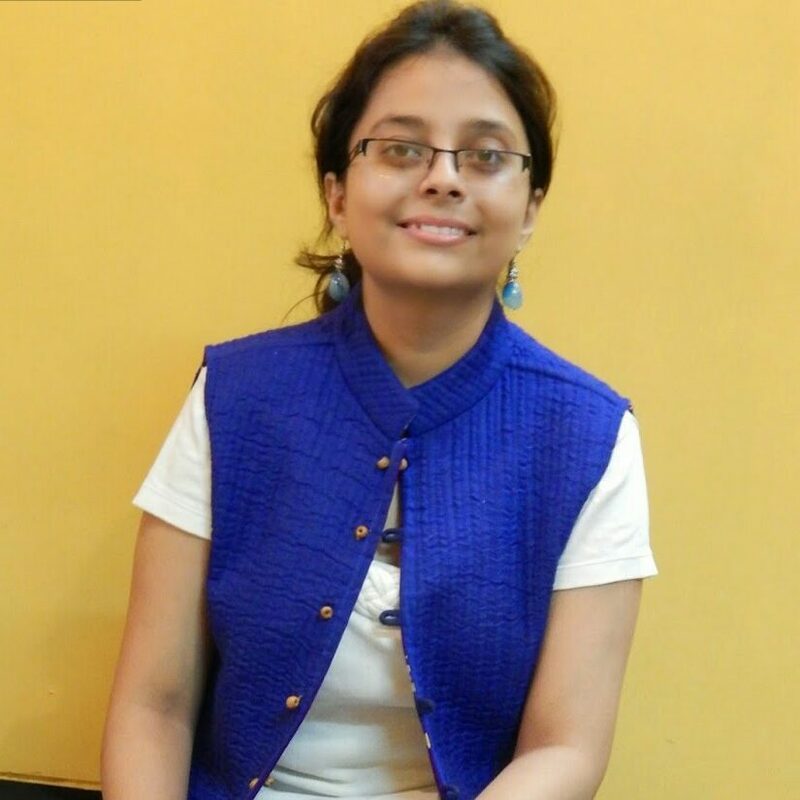 Congratulations Khushboo for being the Ambassador of Bodoland. Such an honor !. After reading your thrilling account of bathing Ratnamala & Jaymala , I wish to rush to Smiling Tusker Elephant park with my niece & nephew asap. Exciting description and wonderful photographs. wish I could bathe the elephants…. This looks so incredibly fun!!! Wow! This sounds sooo exciting! Can’t wait to experience such an adventure. Hope you had a great time. Elephants are so fierce, yet so gentle and have such sweet souls. I would love to be close with them like this one day! Awesome experience! Sounds like a rad fun day! Thanks for sharing. Nice read :). Amazing experience! Thank you for sharing.. I love elephants and this seems to be a great a great place to see them. Lucky people! I am in awe. Elephants are beautiful and majestic animals and this is a fabulous experience. I live in the UK and haven’t travelled much. The only time I have seen elephants is at the zoo. Wow, such a wonderful experience! I love that you can bathe the elephants, too. Wow, elephants are so stunning! I would really love to see one in the future. You guys had a very exciting adventure with the elephants. How I wish I could try this out! This is such a cool opportunity you have. Sounds like you have such a cool life full of adventures. One of the best things about traveling is to learn about the culture of that place and also the experience you get. That place sounds really cool and enjoyable to visit. They are so big. So a wonderful experience looks like you really had a great fun. This is amazing. What a great experience. 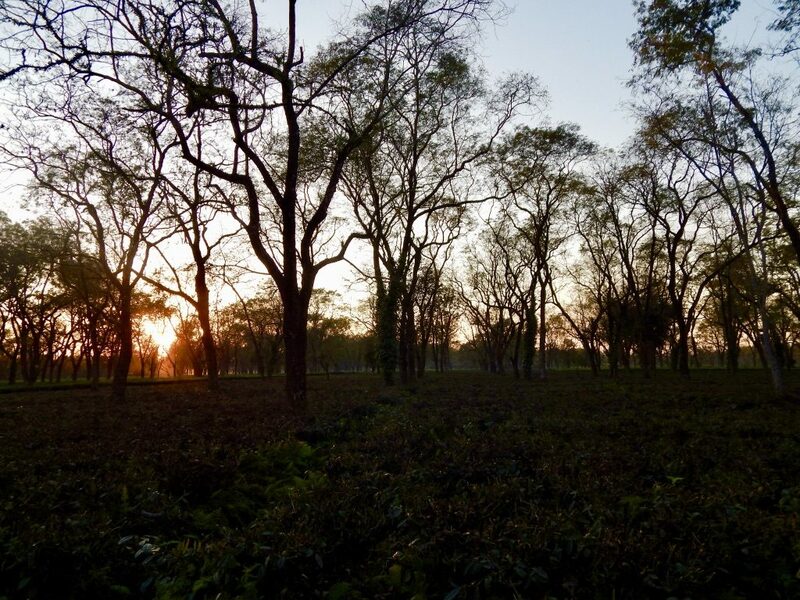 The tea garden looks so peaceful and relaxing. I would be so down to hangout with elephants. They are so adorable!! Elephants have to be one of the most magnificent creatures. I love them so much. This looks like so much fun. What a great experience. I would have no problem hanging out with elephants for the day. That is so cool. I’ve never been anywhere like that. Closest I got was a ride on an elephant at a circus when I was a kid (something I totally don’t agree with now, but I was a kid). That looks like such an incredible experience. Oh how exciting! What an incredible experience this must have been. Gorgeous photos too. I have a similar experience in Chiang Rai Thailand. They called it Elephant camp and we went in to ride on the elephant through the forest and river. Feeding the elephants are another interesting part too. I love these creatures as they are so smart and cute. I would love to visit Manas one day. I can NOT believe you were able to do this with elephants. They truly are majestic looking animals! I feel as though when we look at them we see a glimpse of what dinosaurs would have looked like. Great place, really dreamed of seeing elephants in person. Lovely photos! Thanks for sharing this. I have never been there but it sounds like a nice destination getaway during Summer. Bet you really enjoyed it. I always feel bad about people riding elephants. I would love to be able to visit a place this and just watch them. Exciting! What an incredible experience that you got to experience. This is on my bucket list. Omg I just love elephants!!!! This must have been one incredible experience!!! What an amazing experience! I would love to experience this one day. Thanks for sharing!